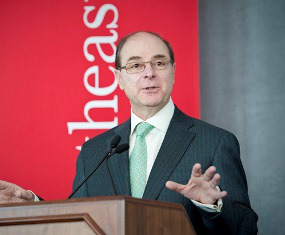 Northeastern University president Joseph E. Aoun says that higher education leaders need to pay close attention to the views of young Americans given that many American colleges and universities are facing difficult times. WASHINGTON — While placing a high value on higher education, the generation of young Americans now in their late teens can also be described as highly entrepreneurial and self-directed, a new national poll has found. On Tuesday, Northeastern University officials unveiled wide-ranging survey results detailing the life aspirations and social views held by Generation Z, or 16- to 19-year-old Americans. Poll results derived from a national sample of 1,015 16- to 19-year-olds include their views on higher education, civic engagement, public policy, technology, financial literacy and personal aspirations. Forty-two percent of those surveyed expect to work for themselves during their career, a figure that is nearly four times larger than the rate of self-employed Americans. Nearly two-thirds, or 63 percent, declared that it is important for colleges to teach entrepreneurship and almost three-fourths, or 72 percent, indicated that they believe that colleges should permit students to design their major, or course of study. In addition, minorities reported high levels of interest in entrepreneurship. Sixty percent of 60 percent of African-Americans and 59 percent of Latino respondents say they are most likely to expect to work for themselves later in life. With respect to higher education, 81 percent of respondents said college is very or extremely important to having their intended career. In contrast, 74 percent of the general public has a similar view about the importance of college. Nearly two-thirds, or 65 percent, of respondents say college is worthwhile and believe that its benefits will outweigh the costs. Presiding over a poll release forum discussion in downtown Washington, Northeastern University president Joseph E. Aoun made a plea that higher education leaders pay close attention to the views of young Americans given that many American colleges and universities are facing difficult times. Northeastern’s Innovation Imperative surveys, launched initially in November 2012, have focused on topics including workforce preparation and the future of American higher education. “We believe that talking to Generation Z and listening to them is a great way of understanding what needs to be done in the next iteration of higher education. Higher education will have to change and I think the change is going to be led by the customers,” Aoun said. Generation Z members expressed worries about their financial futures, including the cost of college with 67 percent saying they have concerns about being able to afford it. With 76 percent worrying about college affordability, Latino teens expressed the most concern over college costs among the racial and ethnic groups in the survey. Respondents also worry about student loan debt. Only 44 percent say they think they would be able to handle $100 in monthly student loan debt payments; 25 percent say they don’t think they would be able to handle any monthly debt payments at all. Generation Z respondents say their financial concerns extend beyond their expected postsecondary education years. Sixty-four percent worry about being able to find a job and 60 percent express concern about having enough money after college, according to the poll. On a number of social issues, Generation Z teens expressed strong support for equality. Fifty-five percent said everyone should have the right to become a U.S. citizen, regardless of where they were born and how they arrived in the U.S. Seventy-three percent said that everyone should have the right to marry no matter their sexual orientation, and 74 per­cent said transgender people should have equal rights. Dr. Bridget Terry Long, academic dean and Saris Professor of Education and Economics at the Harvard University Graduate School of Education, said the poll results indicate that Generation Z members have some confusion over the risk they need to shoulder as college students to improve their chances of becoming able to support themselves with quality employment. “There are some contradictions in the results. [Generation Z teens have] heard the message that college is worth it. But then given what’s happened in the last several years they’re very worried or not they’ll be able to find a job; [and] whether or not they’ll be able to support their families,” Long told the forum discussion audience. “They’ve also heard the message that college [loan] debt is bad, but unfortunately they’ve taken it to the point [that] all college [loan] debt is bad,” she noted. In addition to Aoun and Long, others who participated in the Meeting Generation Z discussion were Amy Scott, an education correspondent with the “Marketplace” public radio news program, and Keyaun Heydarian, a McLean, Virginia, high school senior and the founder of CollegeRoleModel.com. Kai Ryssdal, the host and senior editor of “Marketplace,” moderated the discussion.